Can I Run with a Split Peroneal Tendon? Today on the Doc On The Run podcast, we’re talking about whether or not you can run with a split peroneal tendon. Okay, before we get started you have to understand that specifically in this episode we’re talking about split peroneal tendons. We’re not talking about tenosynovitis or tendonitis of the peroneal tendons. It’s not just the irritation of the sheath around the tendons but we’re talking about serious damage where you have a split in the tendon and also just to be clear, a split is not a rupture. So, in terms of terms you have to understand the difference between these things when you’re really trying to figure out what’s going on with the condition. Now, when doctors talk about a rupture of the peroneal tendons they’re talking about a complete split, where the tendon is now in two pieces, not connected anymore. So, in that case when you try to stand up on your toes, the first metatarsal moves out of the way because the peroneus longus, if it’s ruptured, it’s move out of the way, not hold that bone down against the ground and it’s completely ruptured. It’s torn in a way that it’s no longer connected and it’s no longer functional. With the peroneus brevis, if that one is ruptured, well since the peroneus brevis is the primary evertor of the foot or the one that holds your foot stable, your foot would drift in to a dramatic supination because it actually can’t pull your foot back up underneath you and that’s also a completely different thing. That’s where you completely ruptured the tendon. It’s no longer attached to the bone in your foot where it’s normally attached and so when you fire the muscle, nothing happens. It doesn’t stabilize your foot anymore. That’s different than a split. When we talk about a split, we’re talking about a longitudinal split. So, if you take the tendon along its longitudinal axis and you split it in the middle so that it’s intact, it’s still attached to the muscle, it’s still attached to the bone where it pulls and provides force and stability. It’s not ruptured. It’s not cut in to two pieces but it may be split along its longitudinal axis. That’s a different thing. So, that’s the first thing you have to understand is that there is a split, not a rupture, not tenosynovitis. We’re just talking about these longitudinal split in this episode. When you’re trying to figure this out, is which of the two tendons is it? You have two peroneal tendons. You have the peroneal brevis and you have the peroneus longus. So, these two peroneal tendons sit in the back of your leg, on the back of the fibula. The longus is longer than the brevis, as the name implies, and the longus muscle sits above the brevis. Now, these two tendons come down together behind the back of the fibula and then they sit in a common tendon sheath. You need to know which tendon it is, because it’s different treatments for different tendons and it depends a lot on what’s going on with the two tendons, if one of them is split and the other one’s not, where the split is. It all really matters. If your brevis is split, it depends on the location and it’s the same that’s true with the longus. We’ll talk about that as well. The other thing to think about is whether the injury is new, or old, and we’ll get in to that as well. First let’s talk about the location of the split. If you have a peroneus brevis tendon split, this is the one that you read about most of the time when you start reading about things like surgery’s the only option, and here’s why. First of all, it’s about location. Let’s say you have a split in the peroneus brevis tendon and it’s right near where it attaches to the fifth metatarsal bone. Now, nothing really happens there. It’s pulling straight on the bone. It’s not going around a corner. It’s not moving anywhere and in some cases you could actually have a split that calms down and heals in a sense and that it calms down. It doesn’t become inflamed anymore and you get enough collagen around it, that it’s stable, but it’s not healed together. So, now it’s effectively gone into sort of a y shaped configuration. It’s sort of in two pieces where it attaches to the bone but it hasn’t compromised the stability of your foot at all. Now, it is possible that can happen. So, if you have a split like that in that location where it’s near the fifth metatarsal bone or what we refer to as the styloid process, where it attaches to the fifth metatarsal bone, it is possible that you might have that split and it’s not actually cause a problem. In fact, you could have done that in high school or college and it might be an old injury now and now you just have inflammation of the sheath around it but you get an MRI that shows a split and there’s some inflammation around it. But it might not really be pathologic or a real problem for you, but that’s about the only location where a peroneus brevis split might be okay to continue to run on it and you’d have to confirm that it’s an old injury, not a new one. In the peroneus brevis, the one that everybody worries about the most is where it’s up behind the fibula. So, where it curves around the ankle and goes up the back of the fibula, the peroneus brevis is sitting in front of the longus. It’s in between the peroneus longus tendon and the fibula bone at the back of your ankle on the outside of your ankle. So, when you look at that, if we make a cross section through your leg, and we’re looking down in to your leg, where we just cut parallel through the bone, through the leg, everything, and we look down in to your foot with that cut being parallel to the ground and perpendicular to the long axis of your leg. If we look in there on an MRI what you see is there’s the tibia bone, and that’s the big shin bone and then on the outside of your leg you have the fibula bone and then behind that you’ll see two dark circles with normal peroneal tendons depending upon which images you’re looking at. But when you see those, the brevis is the one in front and the longus is the one in back. The reason that’s significant is that if you get a longitudinal split in the brevis, it’s split top to bottom and there’s a little gap when the split is. The problem is, is that the longus is sitting behind that and so when you fire the longus, it pushes forward, because it’s going down around this curve. So, when the longus pushes forward it essentially pushes those two pieces apart and then sits in the middle. In that cross section, when you have one of those longitudinal splits in the peroneus brevis tendon at that level right at the back of the fibula where it starts to curve down and go into your foot, the problem is, is that the longus is pushing those two pieces apart, and so if the two pieces get pushed apart they’re never going to get together again because the longus is forcing its way forward and separating the brevis, and if you keep running on it, you’re going to keep pushing, and pushing, and pushing and actually separating the brevis more and more and the split’s just going to get worse and worse. You can run on it. That’s not a good thing to do though and I actually had a patient I was seeing maybe about 10 years ago or 11 years ago, something like that. This guy was really tough. He was training for a marathon. He started having pain in the outside of the ankle. It started out as some kind of peroneal tendonitis or tenosynovitis but he just kept training. He kept ignoring it. When I finally saw him, it was a couple of weeks before his marathon. He had a huge amount of swelling in the ankle and it was severely inflamed, really tender, he could barely walk on it but he’d been running on it even though he could barely walk on it. So, we got an MRI. Clearly it had a huge split in the peroneal tendon and in fact when we got to surgery it was way worse than it looked on the MRI which brings up another point. We’ll talk about this in another episode but the imaging is often unreliable with peroneal tendon. Sometimes it can make it look like there’s a split, when there’s no actual split. Sometimes it looks like a small split and there’s a huge split, and in this guy’s particular case we went i and we actually looked at him in surgery. I made an incision on the back of his ankle, opened up the tendon sheath. We look in there. His peroneal tendon was split into three separate pieces and the longus was also split in to two separate pieces. It was damaged. It was degenerated. There was tendinosis. It was all mushy and squishy. It was not normal tendon anymore. So, there he was having surgery one week before what was supposed to be his marathon where he’d been training his tail off for months and months. Now, that happened because he ignored it. He kept running on it. So, if you’re sure you have a split in the peroneal brevis tendon in that area, running on it is a horrible idea. That is not a good idea, because it’s going to get worse. So, that brings up the first thing that we discussed here. If you know that it’s going to get worse based on its location and you want to run on it, you can do that but you have to be willing to pay the consequences. So, let’s say for example, you were diagnosed with cancer and you weren’t really a running, didn’t really like running, but they told you you’d never run again, so you decide that the doctors are wrong and you’re going to train for a marathon. You’re training for your marathon and then you start getting peroneal tendonitis. All of your friends have bought hotel rooms and plane tickets to fly to someplace to see you do your marathon and prove that you don’t have cancer and then you get a split in the peroneal tendons a couple weeks before the race. Well, if you hate running. You don’t ever want to run again and you’re willing to run with a bit of pain and potentially make it a little bit worse, so what. If that’s like a lifetime goal and you understand that that’s a real risk, you could run on it. Let’s take another scenario. Exact same injury. Exact same amount of damage but you’re a high school runner who wants to run track or cross country in college or wants to train for the Olympics or just wants to be a lifelong runner. Continuing to run on a peroneal brevis split that’s on the back of the fibula in that area, where we know it’s going to get worse if you run on it, would be an absolutely foolish thing to do. So, you should not do that. That’s the thing is, you’ve got to determine what your short-term goals are and what your long-term goals are and whether or not it’s in a location that might get better. 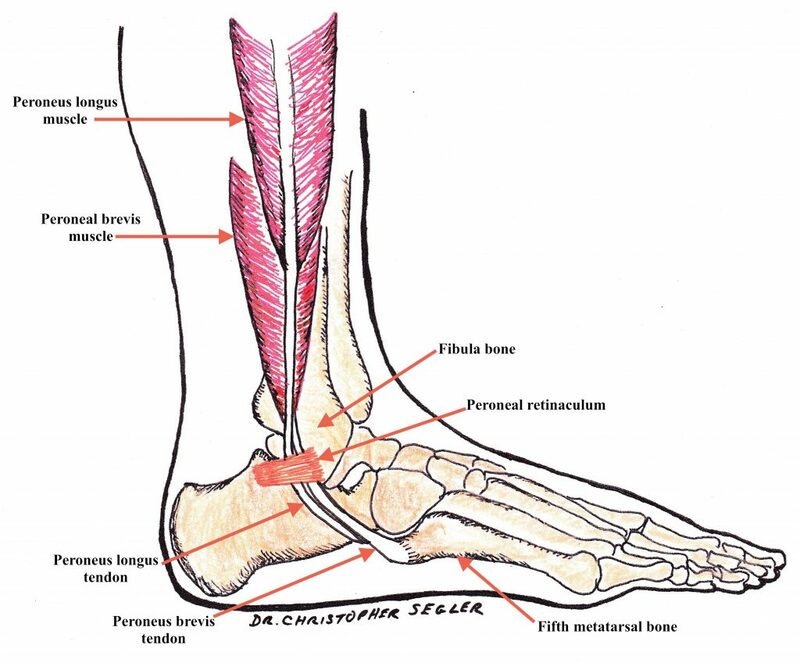 Now, the peroneus longus is more complicated in the brevis because it runs behind the brevis at the back of the fibula. It curves around the ankle with the brevis around the fibula bone and then it actually curves underneath the brevis tendon, goes through a groove in your cuboid bone, and then continues across the bottom of your foot to attach to the base of the first metatarsal. Now, if you get a split that’s way down on the bottom of the foot in that area, in an area where it’s straight, where it’s going from one point to another, you really shouldn’t need surgery to repair that in most cases because it should be able to heal together. You don’t have some other tendon pushes the pieces apart. If you do have surgery that’s going to lead to problems. So, if you can treat it non-surgically it would be better. But you really want to confirm that you have a tendon that’s definitely not going to get better before you consider surgery. So, the reason I say that is that these tendons go in a common tendon sheath and one of the problems with surgery is that you’re going to get scar tissue that forms between the two tendons. The term for that is stenosing tenosynovitis, and so if you get scar tissue that sort of connects and binds the two tendons together then it causes pain when you try to run. I actually did surgery on a guy that was a residency director when I was in training and he had this issue. It was bothering him. He couldn’t ski. He couldn’t rock climb. He had very restricted range of motion. It really bothered him a lot. The surgery was not to repair the tendon but actually only to go in and release the scar tissue that he got from the previous surgery. Surgery, it always sounds great, because it sounds like we’re going to fix something. The doctor’s going to go in and repair it. We’re going to make it like new. Trust me, it’s never new again. That doesn’t mean there aren’t cases where you have to have surgery but the primary thing is you have to determine, number one, that you have a tendon that is not going to respond unless you have surgery, and I will tell you, that the previous president of the American College of Foot and Ankle Surgeons told me in front of a huge group of doctors at a conference that it does happen where you get a false MRI, and hearing that it’s really embarrassing to be a well-known surgeon in a residency program. You get an MRI of a runner. You look at it. It looks like there’s a split in the peroneus brevis tendon. We just say, “Yup, that’s it. You have to have surgery.” Then you go in to the operating room, cut the patient open, and you’re standing their with the resident saying, “Uh, well, I don’t know where the split is. I guess we’ll just sew him back up.” Because it wasn’t actually split. There’s this weird thing that could happen on an MRI where it looks like it’s split and it’s actually not. Again, we’ll talk about that in another episode, but the point is you have to confirm that. You either need to confirm it through absolute clinical correlation with the exam or you have to get an ultrasound or some other test. Maybe a repeat MRI to make sure that it’s really there because you can have false negatives where it appears there’s nothing there, when there actually is a split. Like the guy I talked about. It looked like he had one split in his peroneus brevis tendon. He actually had two splits in his peroneus brevis and one in his peroneus longus. It can actually be worse than it looks on the MRI. At the same time, you could have a false positive where it says there’s a split on your MRI but that’s just an aberration where the peroneal tendon happens to curve and it’s not really split. So, you have to determine conclusively, that number one, you need surgery to get it to heal. That’s first and foremost and number two, you have to understand what your goals are and if you want to keep running for a long period of time and you know you have a split that’s going to get worse when you run on it, that’s a dumb thing to do. If you have a split that might be old, or it might not be actually causing the problem, you may be able to run on it. But you would have to work closely with your doctor to figure out which case is yours. Once you do that, you have to be careful when you get back to running. If you have surgery, there’s no question. Afterwards, strengthening and stretching, and all that, it’s crucial. You have to do an aggressive ankle rehabilitation program to make sure that you strengthen all the muscles that have weekend as a consequence of that surgery. You will get weaker, if you have surgery. You will get weaker, if you use a boot. You will get weaker, if you use crutches. You have to build all that back up. The biggest thing that I see doctors do wrong with their runners is that they basically do their normal treatment, even if that surgery. They put them in a boot, on crutches, to recover afterward, and then they end up telling runners in the end, “Well, just use pain as your guide. Ramp up slowly, but use pain as your guide.” Well, that depends on who you’re talking to, so if you’re talking to somebody who’s a sedentary person, their idea of long activity is walking to the coffee shop, or through Wal-Mart, but for a runner, pain as a guide is not a really good thing because they have a high pain threshold already. The guy I’m talking about that had surgery, who was split in all these different pieces with his peroneal tendons, he had a really high pain threshold. He’s a marathon runner. Of course, he has a high pain threshold, and he ran himself into the ground. So, you don’t want to do that but you’ve got to really evaluate what you’re doing as you’re recovering and you have to rehab it aggressively because when you get out of the boot, you get off of the crutches, you’re recovering from surgery, and you start moving again, you’re now at your highest moment of risk. You are weaker than you’ve ever been. You’re stiffer than you’ve ever been. You have less proprioception or ability to tell where your foot is in relation to the ground underneath you, and you’re really at risk of reinjury. So, you’ve got to very deliberately rehab that thing to make sure that you’re getting it stronger, that your ankle is more stable before you re-injure something else. The thing is, you really only have three things to go on when you’re recovering after a peroneal tendon split. Whether that’s conservative treatment with a boot, or a cast, or crutches, or whatever, or if you’ve had surgery. You have three things that tell you whether or not you’re making it worse. You have pain, bruising, and swelling. That’s it. That’s all you have to really go on. So, if you’re getting bruising you’re doing lots of tissue damage. So, if you go out and you go for a run and you get a big bruise on the side of your foot, you did something that really applied way too much stress and you tore some kind of tissue. You broke something. You ripped something, but that tissue was bleeding under the skin and you made it worse. If it’s swelling, well, you’re body’s trying to fix something. That means that you damaged something. So, if you see this return of swelling, or increase in swelling when you’re trying to run again, you’re probably doing damage to it and you need to stop and figure out what that is and then you have pain. So, if you keep a pain journal and you track your symptoms and you try to figure out exactly where the pain is, when it hurts, what you were doing, and you keep really good records on that, you and your coach, and your doctor, you can all generally figure out what’s going on and whether or not what you’re doing is safe or not, but you have to figure out whether what you’re doing is safe or not. The problem with medicine as I see it these days, is every patient, every doctor, they all want one answer. The patients all want one answer and what’s going to make them better faster. The doctors want one treatment, that’s going to help you. That’s makes the job easier for the doctor. So, many doctors will say, “Well, you just have to stop running.” Well, that’s absurd, right? You’re a runner. You’re not going to just stop running. It doesn’t mean you shouldn’t stop running for a period of time but the whole idea that you should just stop running is ridiculous. At the same time, if a doctor says, “Well, a cast and crutches for six weeks will definitely let this thing heal.” That’s true in most cases with these kind of injuries, if the tendon is going to be able to heal it’s going to be able to get back together, but there’s a risk with that. If you wear a cast and crutches, you’re going to get some permanent atrophy in your calf. You’re going to be permanently stiffer. You’re going to be weaker. You’re going to lose all your neuromuscular connections and you’re obviously going to lose all your running fitness. All those things put you at risk of re-injury when you get back to running. So, splits in the peroneal tendon are definitely difficult problems. 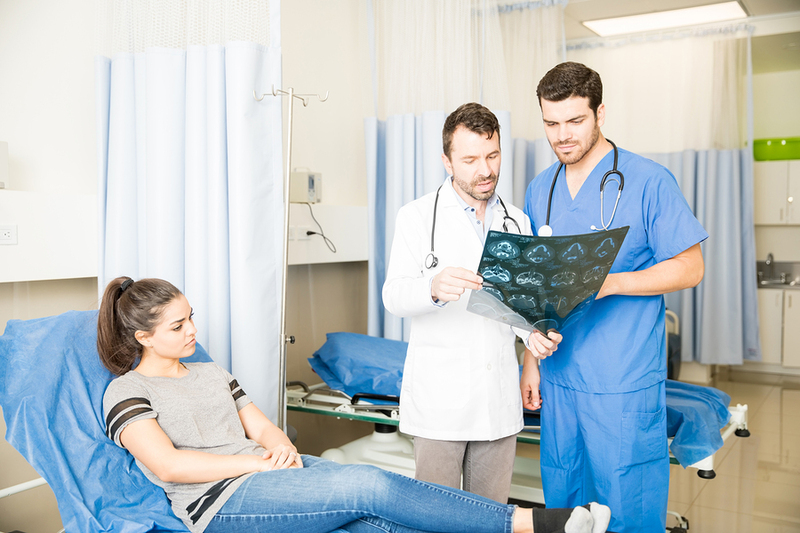 Depending upon the location, depending upon what your goals are, will help you determine whether or not you actually really need to have surgery. But no matter what the case, you need to think about it very carefully and you’ve got to talk to your doctor at length about what your specific goals are, short-term, long-term, all of it. 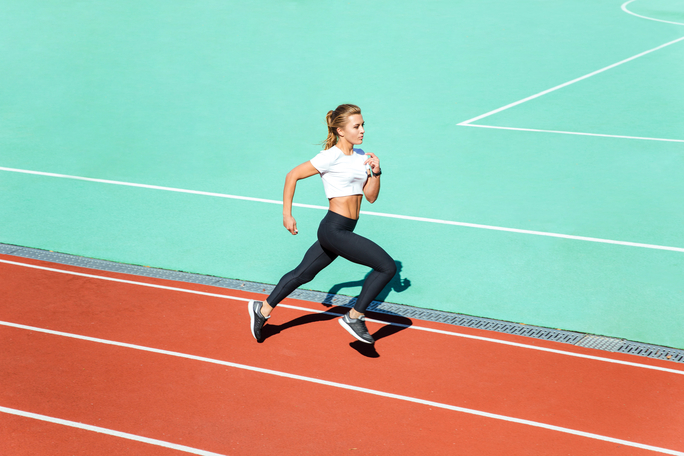 You have to make them understand that you plan to run again, you want to run again, you want to get back to running as quickly as possible, and you don’t want to lose all of your fitness while you’re recovering. 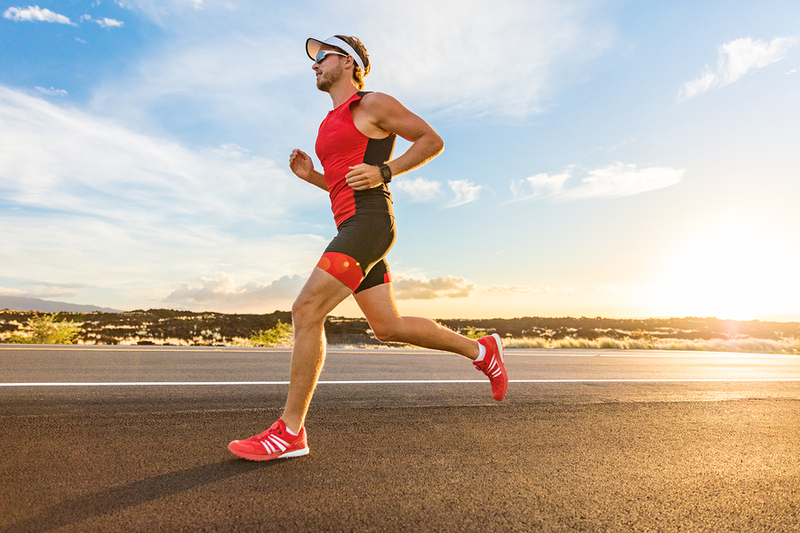 If you work closely with your doctor and you do the right stuff, you can heal a split in the peroneal tendon, peroneus brevis tendon, or the peroneus longus tendon, for that matter, but you have to understand where it is and what treatment is really necessary and what is going to help you the most to get back to running and keep running.